one guy on top rope, one shaky leader, one guy out of the picture rappelling down - busy, busy, busy! 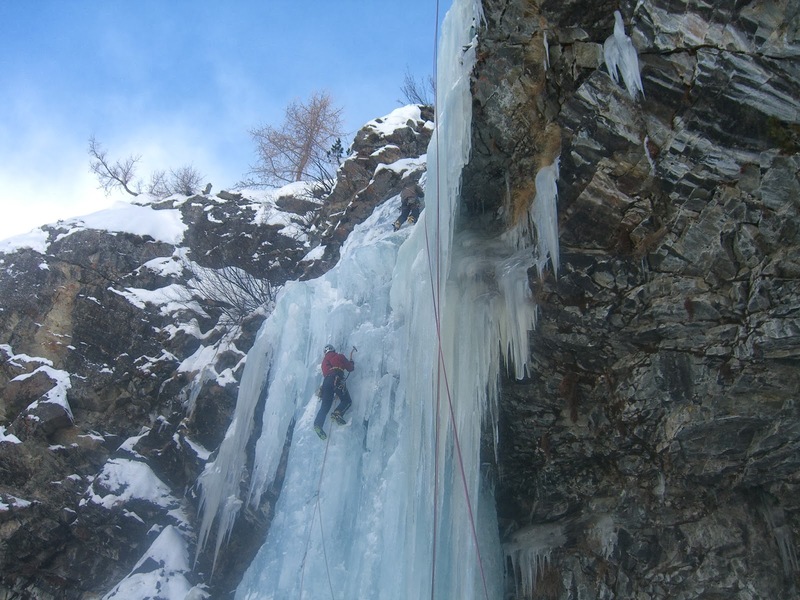 Our first climbing day in Cogne coincided with a sunny Sunday with agreeable temperatures of -2 to -4 for the highs. Needless to say, we weren't alone. As there are many places in Europe, particularly north of the Alps, that are "ice starved", Cogne is one of the few places where there is enough ice. On Saturday Wolfgang and I made the long drive from Salzburg over the Brenner pass, into South Tyrol, took a right turn north of Verona, went past Milan and finally entered the Aosta valley. Turning left 60 kilometres before Courmayeur with climbed to 1600 meters and reached the village of Cogne after more than eight hours on the road. We got into our friends simple pension and were immediately impressed with the amount of snow. Giorgio said he's shovelled, "seven tons of snow so far this winter, it just keeps snowing". We settled in and then walked into the village under light snow and frosty temps. Before a dinner of pizza, we checked out the weather, snow and avalanche bulletins posted at the guide's office - avi level 3-4, 1.5 meters of snow, 10cm of fresh snow expected, a short in-between high-pressure system with gusting winds and cold temperatures. Sunday dawned and we went to the end of the valley, heading right into the vally at the village of Lillaz. We stayed on the valley's right side and went in search of a moderate climb with the opportunity to get an impression of the ice and snow conditions. We walked past some of the popular classic climbs and saw that there were a lot of ice climbers underway. It seemed as if there were 3-4 rope teams at all the falls. We ended up choosing a climb that didn't seem too crowded and went at it. The other rope teams were either with French guides or were really inexperienced. A young Swiss couple laboriously made their way up snow-covered WI3 terrain below us while a British pair nervously got on the WI4 pillar that was climbed out with steps and hooks and placed a screw every 1.5 meters in between telling the belayer, "watch me here". Not the most relaxing atmosphere for a warm up climb. We finished and rapped-off after passing all the parties and not allowing ourselves to get literately and fugitively tangled up with them on the descent. Before going into the village for afternoon coffees, we walked a bit around to check out climbs over the next days. There are some good conditions and some hard routes have formed that were not formed last season.